This name is of Medieval English origin, and is one of the many personal and surnames generated by the very popular given name "Robert". In the main "Robert" was introduced into England by the Normans after the Conquest of 1066, although it had been found occasionally in England before that. The name is Germanic in origin and is composed of the elements "hrod", meaning renown and "Berht" bright or famous. Hobb(e), Dobb(e), and Nobb(e) were quickly established as short forms of "Robert" as in "Hobbe Litel", (1176, Shropshire). The addition of the diminutive suffix "kin" created another family of names such as Hobkin and Hipkin, while Hopkins, Hopkynson and Hopkinson are the patronymic forms meaning "son of Hobb". 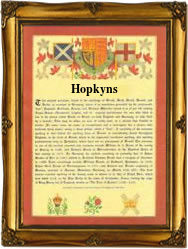 Edward Hopkins (1600 - 1657) emigrated to America in 1637 and became Governor of Connecticut as well as helping to form a Union of New England colonies. The Coat of Arms most associated with the family has the blazon of a black, on a chevron, between three gold pistols, three red heraldic roses. The Crest being a castle in flames proper. The first recorded spelling of the family name is shown to be that of John Hopkyns, which was dated 1327, in the Staffordshire Subsidy Rolls, during the reign of King Edward 11, known as "Edward of Caernafon", 1307 - 1327. Surnames became necessary when governments introduced personal taxation. In England this was known as Poll Tax. Throughout the centuries, surnames in every country have continued to "develop" often leading to astonishing variants of the original spelling.